"Why I like Judge Dredd"
I started having 2000AD comic right from the first issue in 1977. I can just about remember the animated advert featuring a skyscraper landing bang in the middle of a city, and the 'Editor', the 'Mighty Tharg', grabbing a copy and telling us to go and buy it. And of course the first free gift-a sheet of stickers that showed futuristic circuitry, that you could put on parts of your body, to make you feel like a robot, something akin to 'The Six Million Dollar Man' or 'The Bionic Woman' two popular T.V. series of the time. 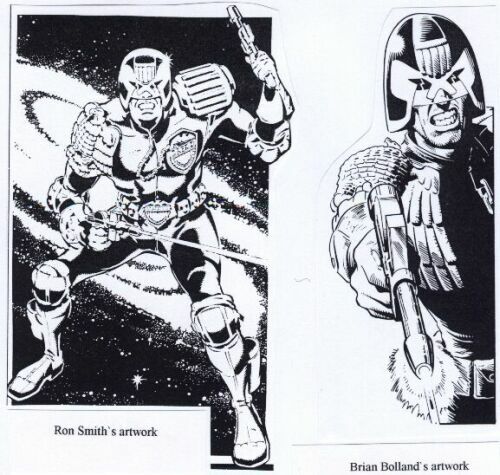 At first, to me, Judge Dredd was just another 2000AD character, then, along came Brian Bolland's 'clean' and detailed art, and the fact that the character was always helmeted-disguising his true identity (plus the fact that I had been interested in U.S. Airforce flying helmets and masks for years - especially the 'slot visor' type, and I have a collection of these, and which had always - at least to me anyway, made the pilots look somewhat alien in appearance), I was soon hooked. Then came Ron Smith's artwork, more 'clean' and even more detailed, and the weeks quickly seemed to get longer as I waited for each issue to come. Judge Dredd was created by 2000 AD Editor Pat Mills and John Wagner - the latter partly basing the concept on a futuristic. Dirty Harry 'type' character, portrayed in the 70' s films by Clint Eastwood. A few years later, with Dredd's continuing popularity, and with Superman holding his ground well against the groundbreaking technical achievements of Star Wars, proving that superhero films were still profitable, and with the possibility of either a Judge Dredd film or T.V. show being talked about, an opinion poll was conducted ~ 2000 AD to find the most popular actor that the readership felt should fill the role - Clint Eastwood came out as the most popular choice. No doubt this was mainly due to his previous experience of playing characters who mainly worked alone and who, whilst not over stepping the mark-well not too much anyway, handed out their own form of justice, and were also, in the main, incorruptible and unbribable. I saw Dredd through some of his finest early stories: Judge Death, The Cursed Earth, Judge Caligula, The Judge Child, Robot Wars (as far as I am aware, there is no connection with the BBC-2 show), and a number of others. I stopped buying 2000AD in the mid 80's. Why?...I think that I just simply grew out of it, but I always liked the character of Judge Dredd. Like Eastwood's Harry Callahan character, Dredd is totally unbribable, and incorruptible, has the authority to take no nonsense from anyone and upholds the law with the same dedication that some people follow their various religions. I cannot remember exactly where, but in the mid-90' s I began to hear rumours that there was to be a Judge Dredd movie, with American actor Sylvester Stallone taking the title role - but unlike the comic, Dredd would show his face, though seeing as Stallone is such a big star, keeping his face hidden for all, or at least most of the movie would have been rather daft to say the least. When I first saw the movie costume, it did not take me long to get used to it, it mainly comprises three key elements: 1, the mainly dark blue colour giving it that 'police' look; 2, the armour - though futuristic, did have some elements that are not to dissimilar from that used by modern-day riot police; and 3, elements lifted from the comic so, though different, the costume could not be mistaken for anything other than 'Judge Dredd'. I do know that a comic-version of the Dredd costume does-or did exist-used for publicity purposes when the character first became popular, though I have never seen it, but I did see two fan made costumes based again on the comic, at Dreddcon:l, one was for Dredd, the other for Anderson, but though the people who were chosen to wear them were a foot to short, the costumes still looked good. 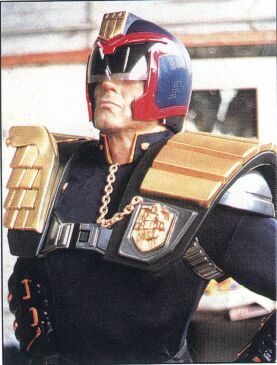 I had often thought that I could have a go at building a Judge Dredd (movie) costume, but never had the guts. I had been to a few conventions over the years, where a number of people had worn costumes-either originals, where they had to make a few, or a lot of repairs and restorations, or ones that they had made themselves, and these had of course added to the fun and attracted a lot of attention. The skill's, or perhaps I should say abilities, to make the costume come from many years of basically teaching myself. During the 1970's I could never get on with Action Man, so I made little (about 6 inches tall), characters from pipecleaners (I went through the plastercine, Lego and Meccano stage, but found that I could do more with pipecleaners). As time went on, I tried to make clothes for them, very simple affairs, but the more I did the better I became, though I could never take it up as a profession. The modelling began, again, in the 70's, I would make pipecleaner models of things where I was not happy with the toy version, or a toy was simply not available or was too expensive - I reckon that I must have saved my parents hundreds of pounds over the years, by building things myself, that plus a bit of imagination...........As for the kitbuilding, it was all Airfix tanks or aircraft to start off with; it was the beautiful - and often dramatic box art that caught my eye. Then in 1977 came Star Wars and it's mind-blowing special effects, followed by its various followers both on the large as well as the small screen. I was soon hooked and building nothing but Science Fiction models. In the early 80's I began scratchbuilding. I designed some ships, one of which was partly based on an un-used Ron Cobb design for the classic film Alien, I had read in an American mag called Cinemagic aimed at people making sci-fi films in the then still popular format of Super-8 Cine. I had intended to make a film but in the end dropped the idea. The article went to great lengths to describe how to build a detailed spaceship model out of cardboard. Some of the article had American terms and names that I had never heard of, one of these being 'silkspan', but it gave me enough information to use as a guide to build my own models, which I did after several months. It was certainly a learning experience - one being how not to cut my fingers! which I seemed to do more times than I cut the cardboard!!! I have since rebuilt the models in sheet styrene. I then began to realise as to just how inaccurate the kit paint schemes of the film and T.V. related Sci-Fi models were, and was soon making them as close as I could to the studio originals. In 1987, Star Trek returned to the small screen, and on a weekly basis there was a pretty regular influx of different ship designs. I heard of a company called 'Warp' who were producing decent sized kits cast in resin, but these were limited runs, (AMT/IRTL were mass producing styrene kits of the main ships - Enterprise, Klingon, etc at around the £20 mark), and retailing at between £50 to £80, a bit expensive. I noted that most of these 'guest' craft were essentially (the ones that I found interesting anyway), hybrids of the main ships and by utilising parts of the cheaper, mass produced kits, I found that although it meant much more work, and of course research - which in a lot of cases was not easy, and using the experience that I had gained from building the kits, I found that I could end up building, whilst not absolutely perfect, a model which could not be mistaken for anything other than the studio model that it was built to look like, which was at least half the battle won. As time went on, although most of the projects were different, many of the techniques that I used were the same, so as I gained experience, the easier things became, so when it came to building my Judge Dredd costume, a lot of it seemed daunting to begin with, but turned out in the end to be surprisingly easy. I have made costumes before - of a sort. 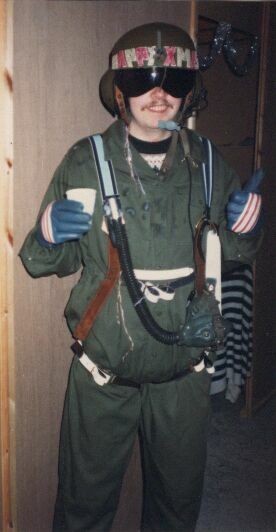 In the late 80's I went to a costume party as a pilot (using one of my aforementioned flying helmets). The costume (if you could call it that! ), was thrown together in about a week, it also utilised my Dad's old green overall, and a parachute harness made from trouser belts! I later made improvements (!?). I bought a proper U.S. Airforce flightsuit and added some embroided patches. I also made some weapons (I had heard or read somewhere that when forced down, pilots only have with them a small pistol). These were heavily based on the 80's T.V. mini-series 'V'. I envisioned that my pilot would be just as effective on the ground as in the air. He also had a tracking/sensing device that I based on an un-used design for a Tricorder from Star Trek: The Next Generation. At the time, this was the most complicated thing that I had ever built It also contained the first L.E.D. circuit that I had ever built (again I followed an article in Cinemagic). 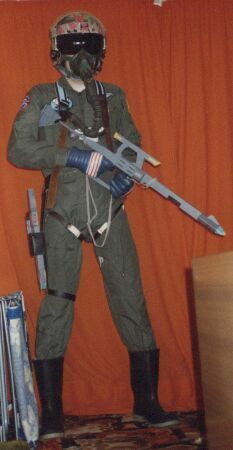 I also later replaced the trouser belts with a better looking parachute harness made from thick green webbing, the same stuff that I would later make the Dredd costume utility belt from. The reason for the helmet being a much lighter blue than the rest of the costume, is that I used a reference photo taken of the costume in the workshop where it was made. The photo (left) is from 'The Making Of Judge Dredd' book - a life-sized cast, including his head, was taken of Sylvester Stallone's body, to ensure that the costume fitted him perfectly. When I build a model or make a costume of something that exists, I naturally wish to be as accurate as possible. So I try to find photographs of items taken in either the studio where they are filmed, or the work area where they are built, or use photos taken outside on location. This way I can be much more accurate as far as the actual colour scheme is concerned. Personally, I prefer fan-based costumes It is still great to see originals or ones that people had partly made themselves but, based on my own experiences, the more work that you put into a costume and get it as accurate as you can - or take the basic concept and use your own ideas, the more you get appreciated and can talk about it, and get more fun and satisfaction, and a much more memorable experience.